Now anyone can start their own ICO/Token sale in several clicks (price: 1 ETH only). We are the first to implement Visual Crowdsale smart contract. Please see how it’s simple: Just fill-in fields (name of token, emission, soft/hard cap, rate & so on) press Launch and wait. 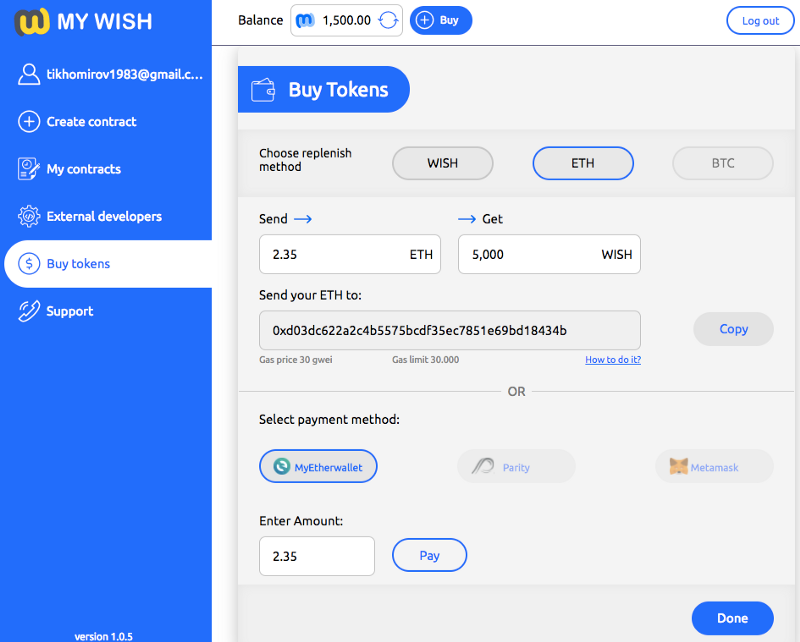 MyWish does all the rest: checking parameters, compilation, smart contract auto-testing & deployment to Ethereum network. No private key is required for contract creation, but only the user has rights to finalize the contract. We are really proud of our new feature. Price of smart contracts development for ICO starts from $2500. Now it is 1 ETH for everyone. Any business or individual does not need Software development or technical background to launch their own ICO. We hope that it will give many people the opportunity to start their own token sale. We are making the technology simple and affordable. WISH tokens are are not connected to our service until now. Now, all actions in our service require WISH tokens. 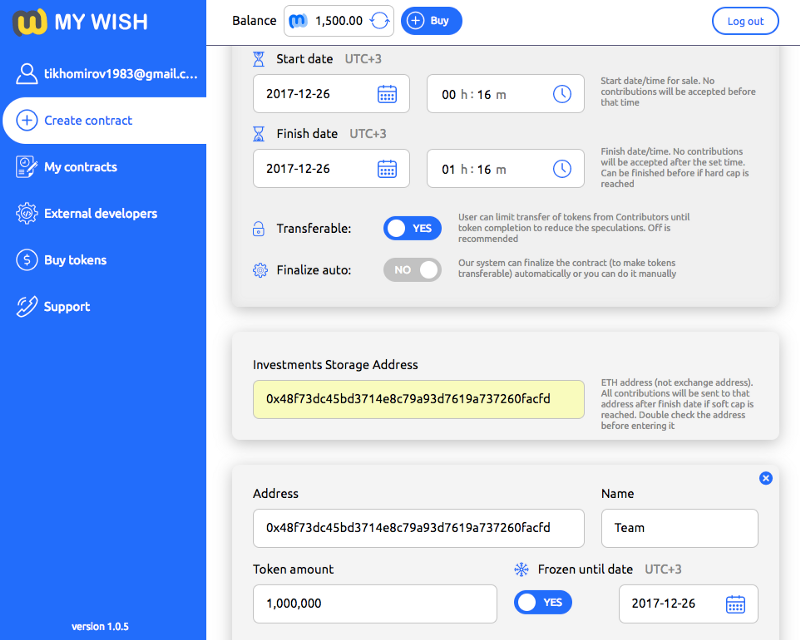 If user wants to create the contract they needs to buy WISH tokens. However, User can also pay for Contracts with ETH. In this case MyWish will automatically buy WISH for the user. BTC payments will also be integrated later this week. 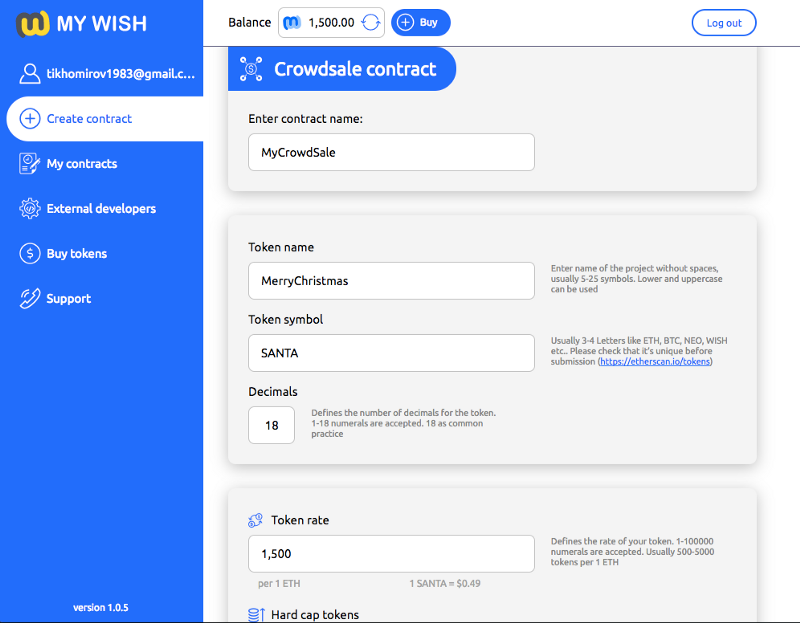 Two projects already agreed to use MyWish crowdsale builder for their ICO. German pension fund — good progress, US branch joined the discussion. Continue negotiations in the beginning of 2018. Smart contract for World-class fitness club agreement. Working on the first version together with club’s developers. Others negotiations will be continued in 2018 because of holidays. Cryptopia is our main priority, so, we will not ask for refund. Finished token verification, legal opinion approved. Discussing the costs for listing. Found direct contact for Tidex, Liqui, Hitbtc — all are under discussion. Weekly statistic: 1731 users (+17.7% since last week).